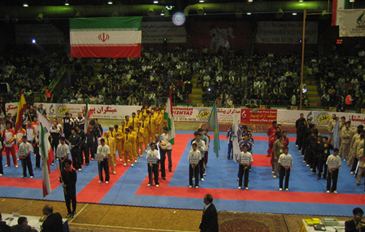 The 18th Fajr International Taekwondo Tournament is under way at the Afrashia Shahid Sports Stadium in Tehran, Iran on March 2, 2006. The two-day event drew about 100 athletes from 10 countries, including Korea and China. Iran won the overall title with three gold medals and four bronze medals. TEHRAN, Iran — WTF President Chungwon Choue paid a five-day visit to Iran to attend the 18th Fajr International Taekwondo Tournament, which was held in Teheran on March 2-3, 2006. It marked the first visit by the WTF head to Iran since the establishment of the world's taekwondo governing body in 1973. Iran became a WTF member national association in 1975. During his visit, Choue met with several ranking Iranian government officials, including vice President Mohammad Aliabadi, who is also the president of the Physical Education Organization; Mr. Reza Gharakhanlou, president of the National Olympic Committee of the Islamic Republic of Iran; and Seyyed Mohammad Khatami, former president of Iran. He also met with Seyyed Amir Hosseini, president of the Iran National Olympic Academy; and Dr. Abdoullah Jassbi, president of Azad University. Choue also had a meeting with Im Hong-jae, Korean Ambassador to Iran. In those meetings, Choue exchanged opinions with them on ways to promote taekwondo, promising to provide curriculum and other technical assistance to Iran in establishing a proposed taekwondo department at Iran's universities. "I will render our knowhow to Iran when it sets up a four-year taekwondo program at universities," Choue said in a meeting with Mr. Aliabadi and Mr. Gharakhanlou. 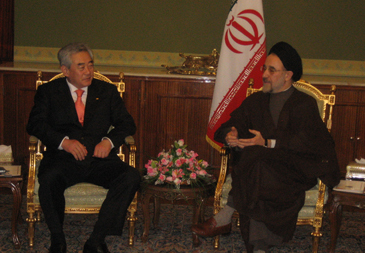 WTF President Chungwon Choue (left) speaks with fomer Iranian President Mohammad Khatami. Choue also invited Former Iranian President Seyyed Khatami to an international seminar on "Sports and Peace" as a keynote speaker to be held in Seoul next year by Kyung Hee University, earning a positive response from the former president. Choue gave an affirmative response to Korean Amb. Im's request for sending a taekwondo demonstration team to Iran this year for the Embassy's proposed "Korea Week." He also gave Amb. Im a right to choose one to two students at the University of Tehran to study at Kyung Hee University on full scholarships. Tehran and Kyung Hee universities signed a sisterhood agreement, but has made no tangible progress in academic fields so far. Choue spoke well of Iran's takwondo performances at home and abroad, calling Iran the "mecca of taekwondo in the Middle East." "I am happy to say that Iran is one of the most active WTF member countries in the world. I could easily see the high popularity of taekwondo here in Iran, which has more than one million taekwondo practitioners and over 3,000 taekwondo coaches," Choue said in his congratulatory remarks during the opening ceremony of the 18th Fajr International Taekwondo Tournament. The tournament, which dates back to 1987 to commemorate the victory of the Islamic Revolution of Iran in 1979, attracted about 100 athletes from 10 countries. The participating countries were Korea, Spain, China, Jordan, Armenia, Kazakhstan, Tajikistan, Armenia, Belalus and Iran. Iran won the overall title at the tournament with three gold medals and four bronze medals, followed by Korea with one gold and three silvers and Jordan with one gold and one silver. The two-day tournament, which was broadcast live for six hours a day across Iran, was held at the Afrasiah Shahid Sports Stadium. While in Iran, Choue visited the Taekwondo House, which served as the venue for last year's Fajr International Taekwondo Tournament. The Iranian government built the Taekwondo House in 2004, in recognition of taekwondo's high popularity in Iran. Iranian athlete Hadi Saei Bonekhohal, the gold medalist in the men's lightweight category in the taekwondo competition of the 2004 Athens Olympic Games, was voted as the World Player of the Year 2005 by the International Committee for Fair Play under the umbrella of the IOC.